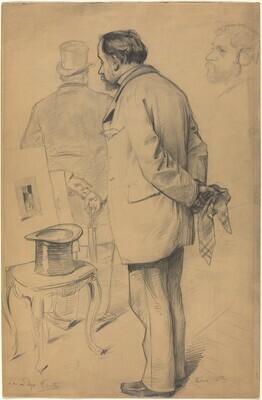 (Degas sale, Paris, Hôtel Drouot, 15-16 November 1918, no. 223); R. Nepveu-de Gas; (The Lefevre Gallery, London); Mr. and Mrs. Paul Mellon, Upperville, VA, 1967; gift to NGA, 1995. The Private Collection of Edgar Degas, The Metropolitan Museum of Art, New York, 1997-1998, no. 888. Lemoisne, Paul André. Degas et son oeuvre. 4 vols. Paris: Arts et metiers graphiques, 1946-1949. Vols. 2 and 3, 1946. Reprinted in 5 vols., New York and London, 1984, 218.